AMHF looks forward and ahead to 100 years of service: 2015 will be its 91st year. Vision: Building a More Compassionate Society—Get Involved! This “vision statement” will be reconsidered in the coming fiscal year, perhaps to stress “The foundation you may think you know” or other. AMHF is working with a fundraiser for the first time, in part to revitalize its image. Mission: The American Mental Health Foundation endeavors to advance mental health in society. As a research organization, it is dedicated to the welfare of people suffering from emotional problems and mental illness, with a particular concern for individuals with special needs and elders. The Foundation advocates improving the quality of treatment, developing more effective methods of research, and making professional treatment available to lower-wage individuals. To this end, AMHF conducts research, organizes educational seminars and Webinars, and publishes books. 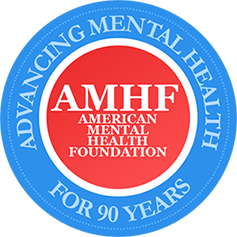 Given the dearth of analysis in the area of predictive psychiatric behavior among youth, AMHF has established as its principal research and programming goal the support of important and necessary studies in the area of early detection and prevention of schizophrenia and related later-life psychoses, publishing these findings (in 2015) under the imprint of American Mental Health Foundation Books. Programs: AMHF offers three programs. (1) Research. In late 2012, the directors approved funding the two-year control study under the direction of Dr. Suzanne Button of Astor Services for Children & Families. Described immediately above (under “Mission”) this is a scientific study of individuals with documented behavioral issues, between the ages of eight and fourteen, to identify factors and causes that could develop into later-life schizophrenia or other psychoses. Out of a group of 350, 13 individuals were identified for intensive study. Interim reports, available on the AMHF site to date, have been issued, and the outline for publication of this monograph is in hand. In addition AMHF and Dr. William Van Ornum of its professional-advisory board (bottom of “About” page), with Pearson Assessments, are in the early stages of developing an improved IQ-abilities test for individuals diagnosed in the severe-to-profound range. Pearson markets Stanford-Binet, the Bayley Scales, Weschler, et al internationally. “No Person Is Untestable”: Potential applications are enormous: e.g., to test aging individuals with Down syndrome for signs of early onset Alzheimer’s Disease. (2) Publishing. On March 24, 2015, Anatomy of Delusion by Dr. Henry Kellerman will be officially published in traditional paperback and e-book formats. Advance copies are shortly offpress. Kellerman appeared on “The Diane Rehm Show” (NPR) discussing his previous work with AMHF, and significant publicity efforts are underway to support the new book. Also signed this year with Dr. Kellerman, for publication in 2015: There’s No Handle on My Door: Stories of Patients in Mental Hospitals and for reissue his classic Group Psychotherapy and Personality: A Theoretical Model, working in the same area as long-time AMMHF director of research, Dr. Stefan de Schill. Altogether, AMHF Books publishes 17 titles. These include 4 by Erich Fromm; 7 on aspects of individual and societal manifestations of violence and posttraumatic stress disorder (PTSD) by Harvard Medical School clinical-psychologist Dr. Raymond B. Flannery Jr.; and 3 by Dr. de Schill on group therapy (issued in English, French, German, Italian), available on the foundation Web site or via Lantern Books/Amazon/Kindle. Several Webinar subjects and facilitators are being explored for 2015, possibly under the sole auspices of AMHF. These include counseling the Hispanic community (Dr. Felicitas Kort), the therapeutic dimensions of superheroes (Dr Lawrence Rubin), and in areas such as depression, suicide, group therapy, alcoholism, OCD. The number of Webinars will be limited to what is economically feasible/sustainable. To support all three programs, as noted AMHF has a fundraiser and marketing specialist on retainers. Their work in 2015 will be closely monitored. A fundraising campaign is required, and such would represent a significant investment. Web site: The Web site was completely overhauled and redesigned by an independent Web designer in mid-2013. It receives an average of 250 hits per day. The goal is to double this in 2015 and increase significant looks/landings. A full Google Analytic has not been performed in 3 years, and will aid in improving the homepage. Web-site interactivity is complicated and not planned. Board of directors: AMHF also has a professional-advisory board. The executive director has possibly recruited one social psychologist to move from there to the board of directors. In addition, a professional with an M.D. degree is desired as is a philanthropically disposed individual with a passion for mental-health work. Income: AMHF has but one modest endowment: the Baschkopf Family Fund. The generosity of Rosaria Tomasetta, half of whose estate came to AMHF in August 2012, has been the prime source of funding to the present fiscal year. Other 2014 donors are listed on the AMHF Web site. Additional, but in truth inadequate, sources of income include earnings from investments as well as the publishing program, which also slipped the first half of this year. Latest AMHF-audit and NYS Charities Bureau filings are posted on the Web site under Donate. Long-range Future; or, Why Contribute to this Charitable Organization? One of the first philanthropic organizations of its kind in the world, AMHF is committed to growth, expansion, and extension of its mission and research in a way that will benefit individuals and society as a whole, particularly focusing, in the future, on the specific emotional needs and issues confronted by the disabled and elders, populations traditionally underserved and of the work of Dr. Stefan de Schill.